Why is it that whenever I make anything with bananas I always have monkey’s on the mind? As in monkey’s at the zoo, not the Monkees that my mom was in love with. I guess it’s because monkey’s eat bananas and I’m sure I’ve seen that at the zoo. But monkey’s don’t get the luxury of putting chocolate with their bananas like we do. Geesh, I’m glad I am a human. Bananas are a handy fruit to have around let me tell ya. My newest obsession is to slice a banana in half lengthwise. Then I spread peanut butter on top of it and sprinkle on some granola or cereal on top of that. It’s like my banana sundae. I eat it for breakfast, for lunch, for dinner and snacks. Just depends on what day it is. Some days I want one, but my nanners are green. Anyone know how to speed up the ripening process of a banana? 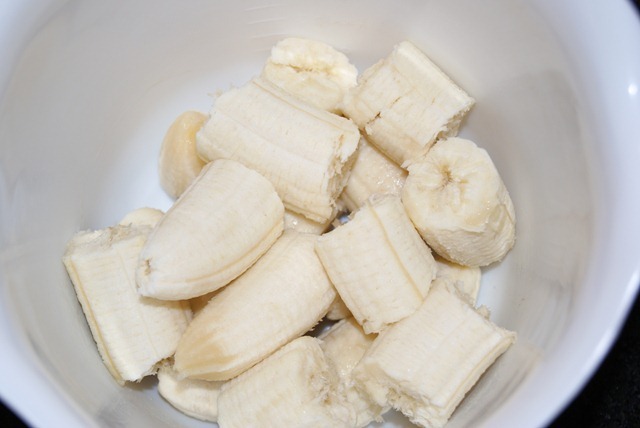 And if you’ve never tried homemade banana fro-yo, try this now! 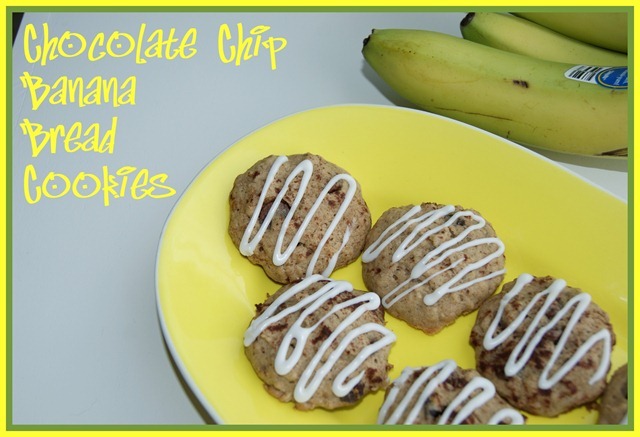 Banana + chocolate + almond flavoring + vanilla flavoring = Banana-rama-terrific! 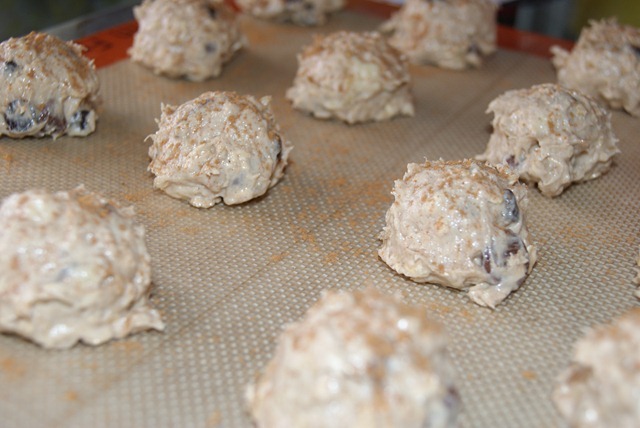 Cream the sugars, peel bananas and mash, add mashed bananas, stir in oats, add chocolate chips and form cookies. Sounds easy right? Preheat oven to 375 degrees. 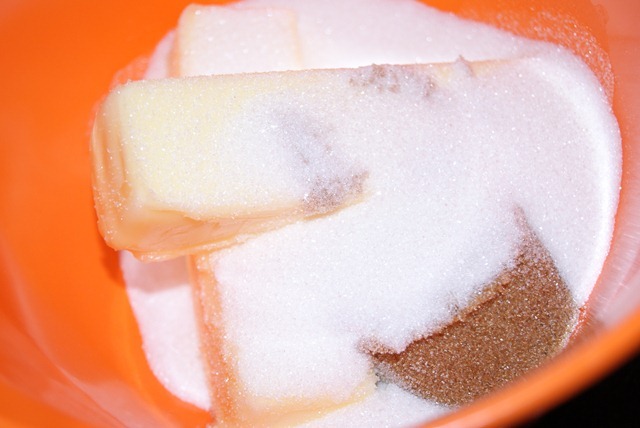 In large mixing bowl, cream together the butter and sugars with an electric mixer. Beat in the eggs and vanilla next. 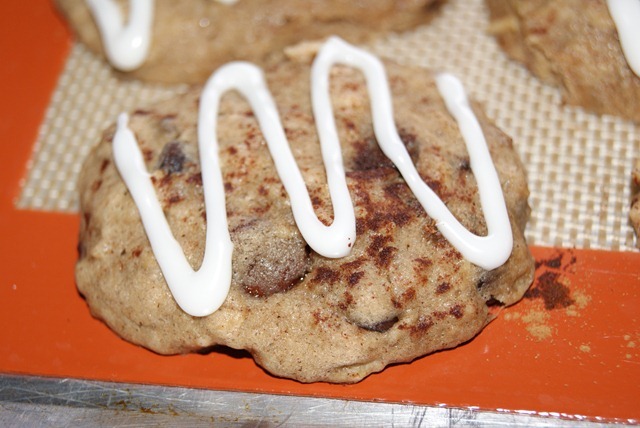 Add cinnamon powder, baking soda and flour. Mix well. 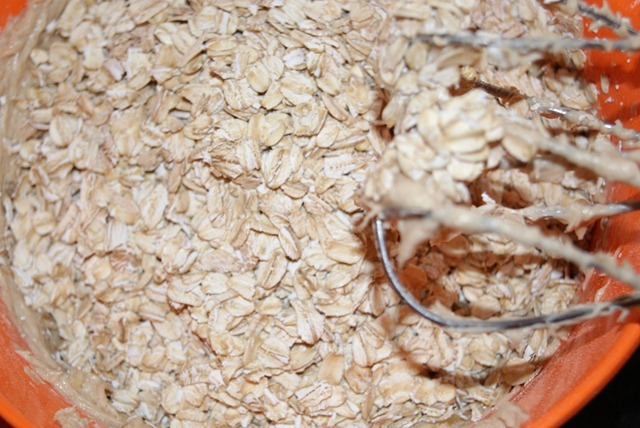 Mix in mashed bananas and oats using mixer. 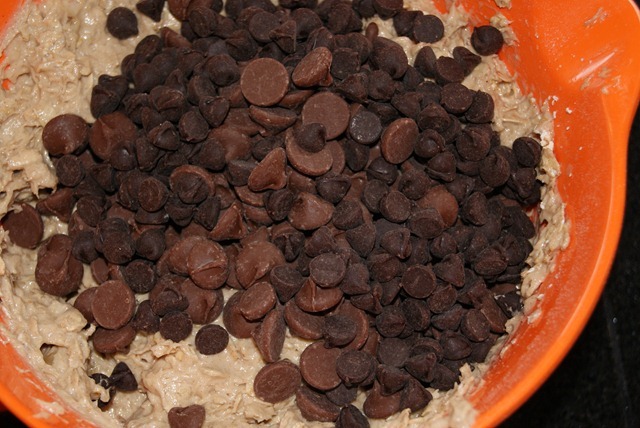 Then stir in chocolate chips with spoon. 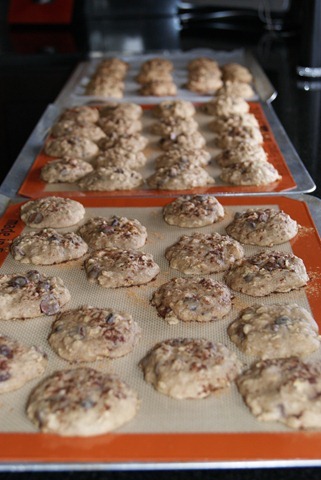 Drop by spoonfuls onto a parchment lined cookie sheet. Or use a cookie scoop. Bake for 10-12 minutes. Allow to cool. 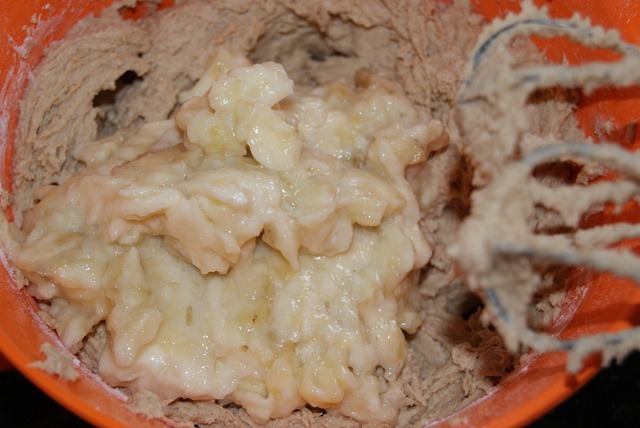 In small bowl mix together frosting ingredients. 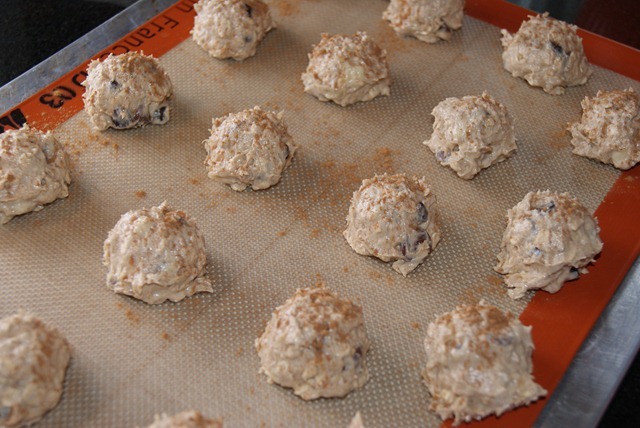 Add enough water until frosting is desired consistency. Place frosting in small baggie. 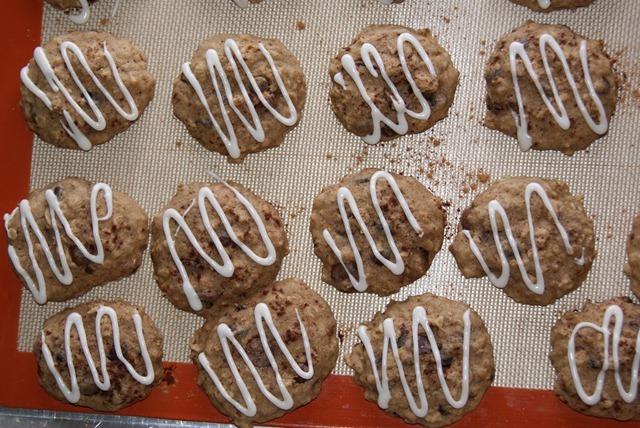 Clip a small corner off of the baggie and squeeze out frosting and drizzle on top of cookies in whatever pattern you choose. 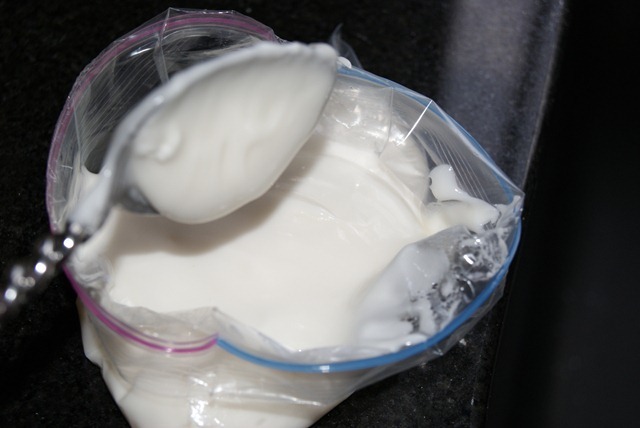 I don’t know where I learned the “frosting in a baggie” trick, but I am sure glad I did. I tried taking a picture of myself frosting the cookies, ha. And before you ask, no I don’t have white hair. Those are feather earrings. 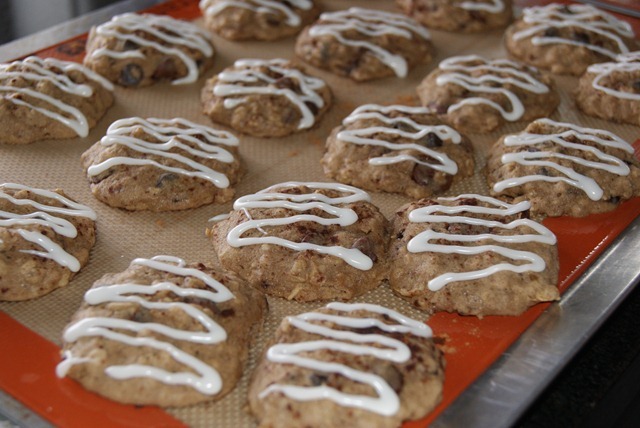 The baked and iced cookies all ready to be handed out once I figure out what to plate them on. 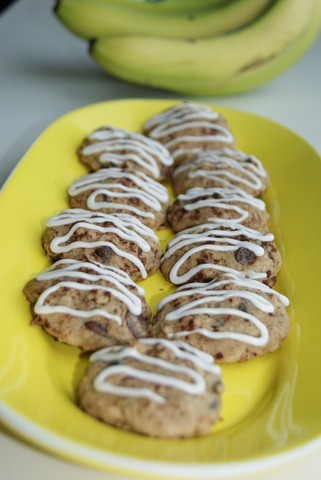 Oh, and I also sprinkled some cinnamon on top of the cookies for looks. Doesn’t that yellow plate look like a banana! PS, don’t use green bananas like I have in the picture here. Scrumdiddlyumptious! Who doesn’t love a soft cookie? I live in an addition where there are lots of new houses going up behind us. And we have new neighbors. What a better way to greet your new neighbors than to walk over with a warm plate of cookies and welcome them to the neighborhood. So I plated some treats on a paper plate I found in the pantry and wrote on it what they were in case they forgot what I told them amongst the introductions and small talk of meeting new people. Ooo, don’t you wish you were my neighbor?! Going out on another delivery run…this time to a friend who is having a birthday. 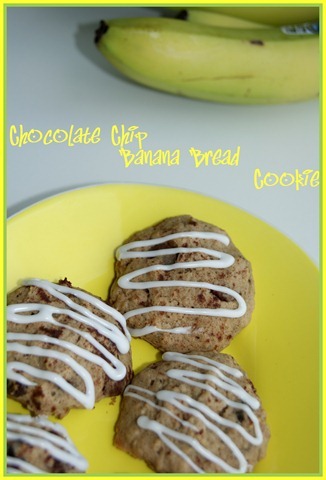 Go ahead and make yo’self some banana bread cookies. Potassi-YUM! 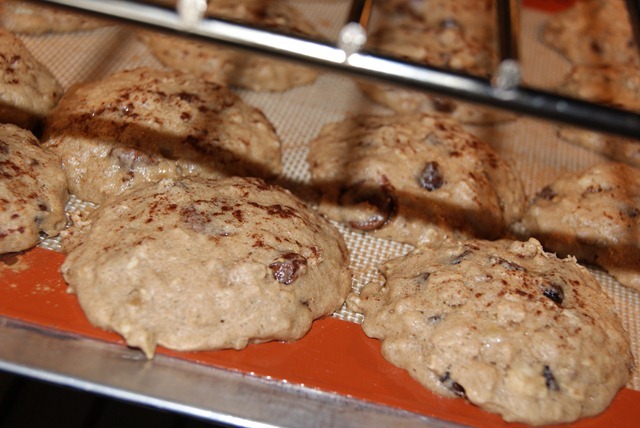 What is your favorite fruit to add in a cookie? Who else thinks the summer is flying by already? 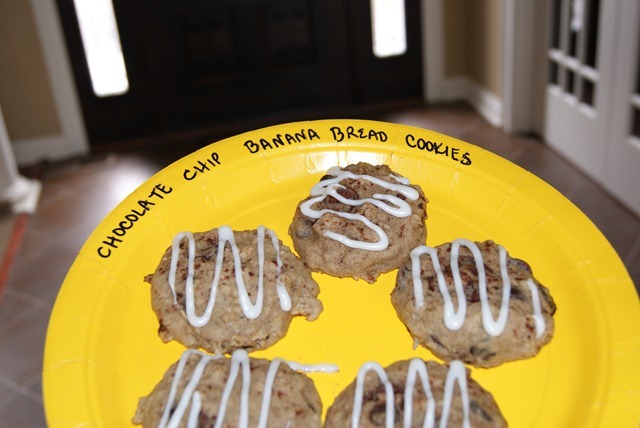 This entry was posted in Deliciousness and tagged Cookie. Bookmark the permalink. mmmm, these look great! 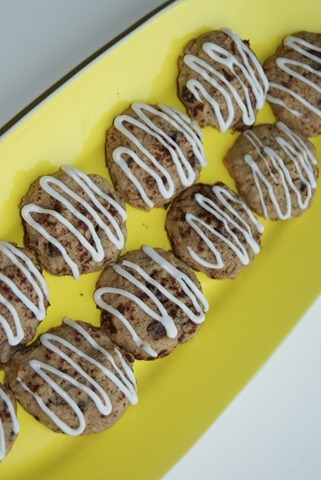 I love any kind of cookie with apples or raisins in them. 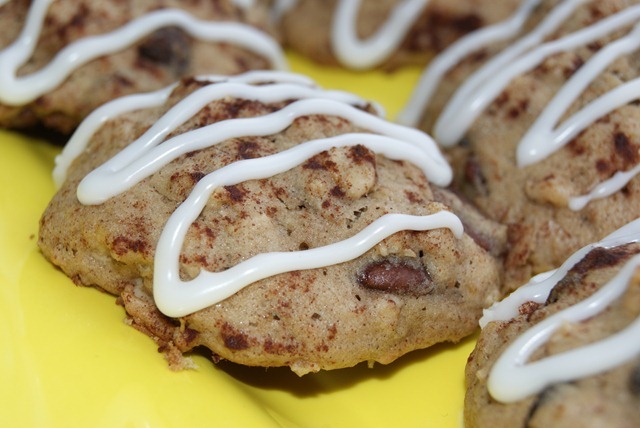 Your latest obsession sounds delicious–so do these!!! I love to use a combination of bananas and apples. 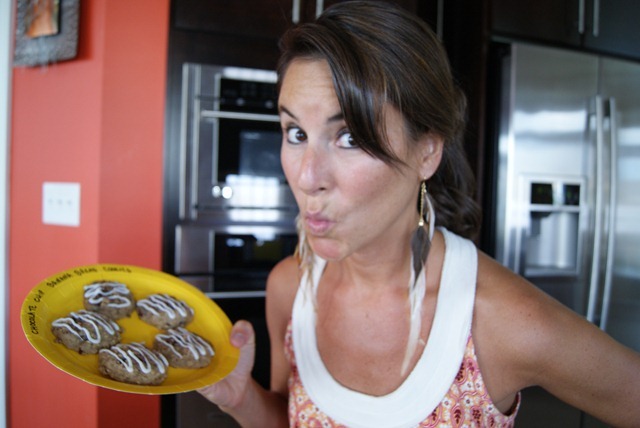 YOUR COOKIES LOOK INCREDIBLE!!!!!!!!!!!!!!!!!!!!!!!!!!!!!!!!!!!!!!!!!!!!!!!!!!!! I sure wish I was you neighbor :). Those cookies took delicious! And the cinnamon on top is the perfect addition for a cinnamon addict like me ;).